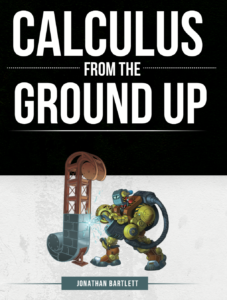 BP Learning is pleased to announce our most recent title – Calculus from the Ground Up! This innovative approach to calculus can be used within both classroom and self-learning environments, and in both high school and early college. The book retails for $34.95. Calculus is one of humanity’s greatest achievements. With calculus, you can analyze the infinitely large, the infinitely small, and everything in-between. Calculus gives you the tools to develop your own mathematics, your own formulas, and, most importantly, your own imagination. Calculus is not just a subject. It is an invitation to think differently about the way that the world works. Calculus has a reputation for being a dry, dreary, difficult subject. However, the problem generally lies with tedious, lifeless books that present calculus with all the vigor of a wilted salad. Calculus was not discovered as a series of dull proofs about the real number line. It was discovered by curious people who took the time to look at the world in a new way. Calculus from the Ground Up invites readers to not just read about mathematics but to become active participants–making numbers and symbols the servants of their minds as they grow their imaginations in ways they didn’t think possible. Calculus from the Ground Up isn’t your typical mathematics book. It is a guidebook for students to learn not only the bare subject of calculus, but also to discover how its artistry impacts other areas of life. Calculus from the Ground Up includes sections on how to solve impossible problems, how to break problems into manageable sizes, how to develop new mathematical formulas, and even how to live a more ethical life, all through lessons gained from calculus. A Solution Guide ($24.95) is also available.